Next training dates: At the moment we are not planning any biosand filter trainings. However if your organization is interested in running one, do get in touch with us. However we do cover biosand filtration on our one-week Technical Training in Water Infrastructure – further information can be found here and the curriculum can be downloaded here. Booking procedures and online or offline application forms are available here. 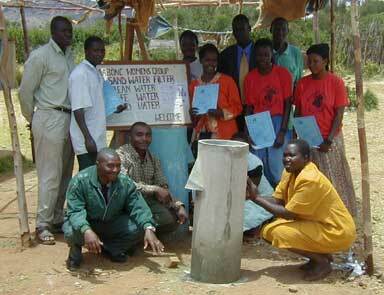 Safe drinking water is one of the most important issues of development work, especially among low-income families. Biosand filtration is an appropriate and low-cost method for household water treatment, and is proven to reduce diarrhoeal incidence. The introduction course offered by BushProof is intended for those who want to learn about household level biosand filtration as an effective household water treatment. The course will provide an overview of the theoretical aspects of sand filtration, but a large part will also involve hands-on practical sessions since the course is held on the project site of an ongoing successful biosand filter project. Practical sessions include construction of concrete filters by the participants, installation and maintenance of filters – as such, participants are encouraged to get stuck in and get their hands dirty! In addition, there will be opportunities for field visits to households in the project area which will give invaluable insight into the longer term use of biosand filters in rural households. The duration of the course is 5 days. The cost of the course per participant varies on when you book and pay. The fee includes tuition, handouts, resource CD which contains a wealth of information on biosand filtration, basic food & accommodation, field trips & practicals, plus transport by van to and from Nairobi. The fee does not include international airfares, accommodation in Nairobi, travel or medical insurance or visa. Further details including rendezvous point in Nairobi will be sent upon application. Note that we have to get a minimum attendance of 5 people to make the course viable, otherwise we may have to reschedule the course. Please confirm with us prior to paying for international flights. A team of biosand filter experts is available to train NGO staff on setting up their own biosand filter project. A general training curriculum is available, but courses can be tailored on demand. An average course takes 5 days and fully equips a local team to set up their own project. If filter moulds are required, these can be purchased as well. Note that trainings can be given on site in most places.